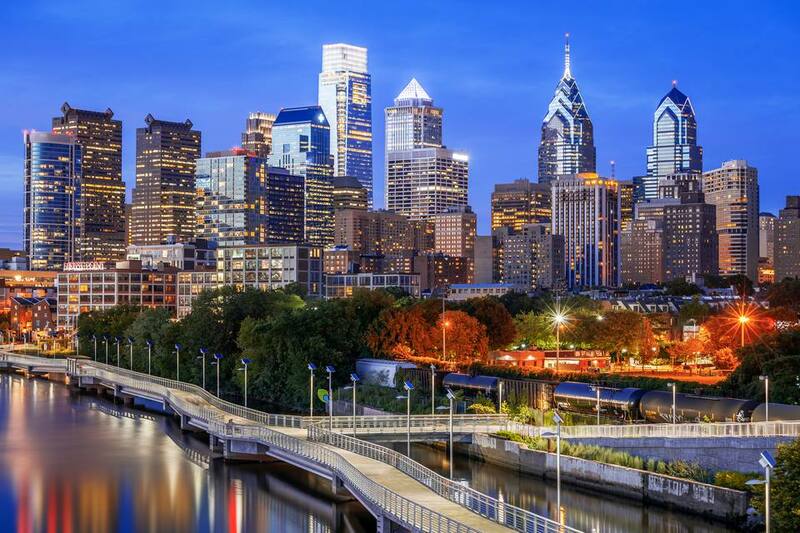 When heading to Philadelphia, travelers have a wide range of options to arrive in The City of Brotherly Love. The city's central east coast location, about a three-hour drive from Washington, D.C. and a two-hour drive from New York City, makes it easily accessible by air, car and public transportation. Philadelphia connects to several major highways including the PA Turnpike (I-276), I-76, I-476, I-95, U.S. 1, and the New Jersey Turnpike. I-676 is the section of I-76 that runs through Center City and continues across the Ben Franklin Bridge into New Jersey. The Walt Whitman Bridge and the Tacony-Palmyra Bridge also connect Philadelphia to New Jersey. Philadelphia is a hub for Amtrak and a primary stop on the Washington-Boston Northeast Corridor route and the Keystone Corridor, which connects with Harrisburg and Pittsburgh. Stations also offer direct or connecting service to Atlantic City, Chicago, and many other cities in the United States and Canada. All trains traveling outside the city depart and arrive at Amtrak's 30th Street Station at 30th St. and JFK Boulevard. The train is considered the most pleasant method of public transportation to nearby cities like New York and D.C., and there are fare specials for off-peak travel, and discounts for seniors or people with disabilities. The Southeastern Pennsylvania Transportation Authority, or SEPTA, has regional lines serving the suburbs of Philadelphia. It also connects to New Jersey Transit in Trenton, which continues to Newark, New Jersey, and New York City. Regional Rail also extends south of the city to Wilmington, Delaware. The Greyhound Bus Terminal offers direct and connecting service all over the country. NJ Transit buses travel between Philadelphia and South Jersey, including the Jersey shore as far as Cape May at the southernmost tip. There are also private bus lines, like Peter Pan and Bolt Bus, that go between the major east coast cities. The Philadelphia International Airport is approximately seven miles from Center City. It offers frequent service for more than 25 major airlines and several discount airlines. It is a major hub for ​Southwest Airlines who offers daily nonstop flights from Philadelphia to numerous cities including Chicago, Las Vegas, Orlando, Phoenix, Providence, and Tampa. Millions of dollars in ongoing renovation projects have resulted in a much better airport experience since the airport opened in 1937, including the Marketplace with more than 150 national and local shops offering food, beverages, and merchandise. Upon arrival, the typical car rental agencies, including Avis, Hertz, and Enterprise, can be found at the airport or in Center City. Getting to the Philadelphia International Airport on public transportation is easy on SEPTA's Airport regional rail line which directly links to Center City. The train runs every 30 minutes daily from around 5 a.m. until midnight and connects with other rail lines that can get practically anywhere within the city and nearby suburbs. Taxis charge a flat rate of approximately $30.00 for travel to and from Center City from the airport and are always waiting just outside the baggage claim area. Nearby major airports include Newark International (Newark, NJ, 85 miles), Baltimore-Washington International (Baltimore, MD, 109 miles), JFK International (Jamaica, NY, 105 miles), La Guardia (Flushing, NY, 105 miles), and Atlantic City International Airport (Atlantic City, NJ, 55 miles). While it may be worth investigating airfares from nearby cities, the lowest cost in total is likely traveling directly to Philadelphia, once the time and money spent in transit from the other airports are factored in.